Coat a panini press with cooking spray and preheat to medium-high. Combine the chicken and barbecue sauce in a large bowl and toss to coat the chicken. Arrange 6 of the bread slices on a work surface. 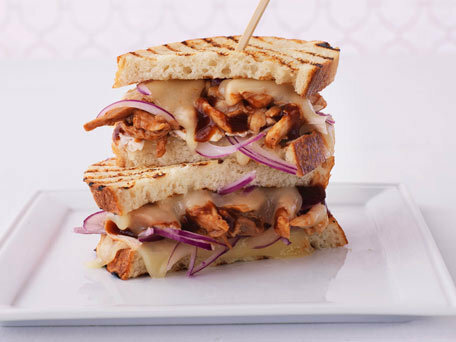 Top each slice with 1 slice of the Swiss cheese, red onion, chicken mixture, and the second slice of Swiss cheese. Top with the second slice of bread. Place the sandwiches in the panini press and cook for 3 to 5 minutes, until the bread is golden brown and the cheese melts.